Syngaschem BV engages in fundamental research on the catalytic conversion of syngas into clean, synthetic fuels, and on syngas as intermediate in green electricity storage. 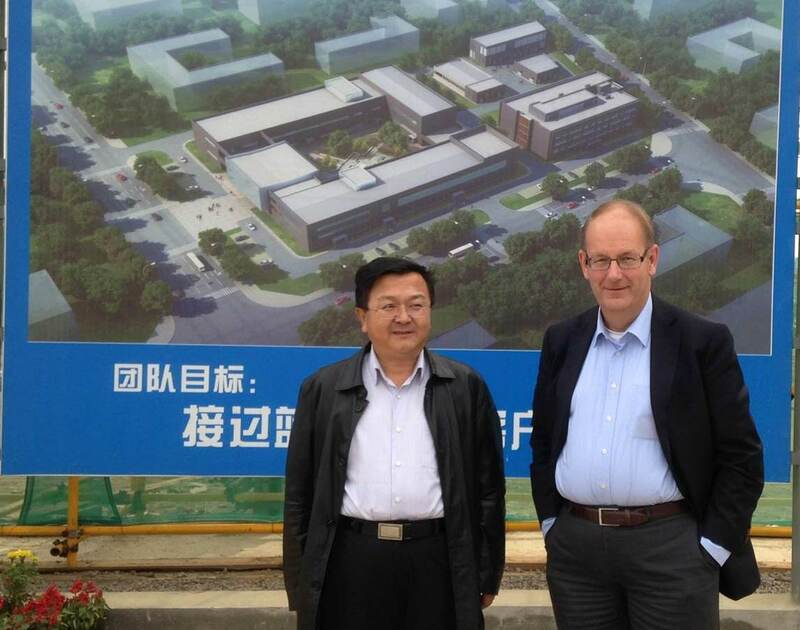 Syngaschem BV is proud to have one of the leaders in Clean Coal-to-Liquids, Synfuels China Technology Co., Ltd, as its major partner. 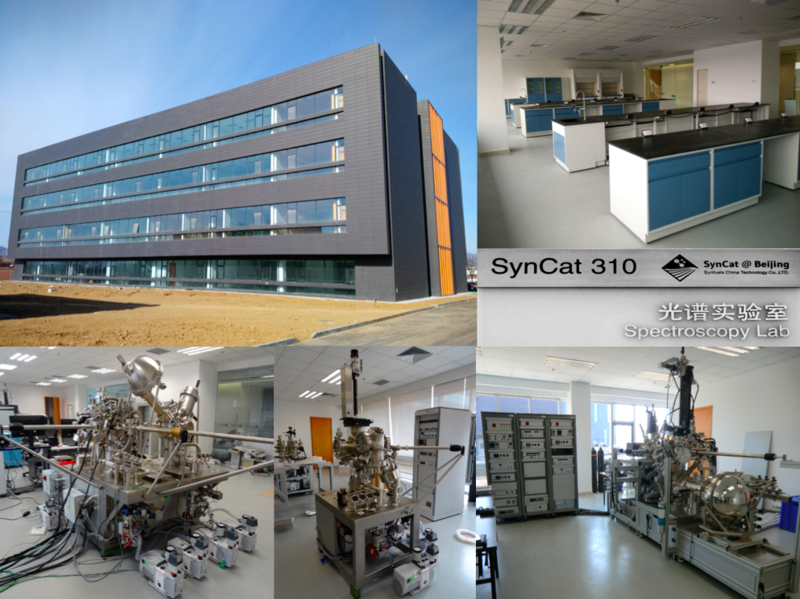 Since 2015, Syngaschem BV and Synfuels China Co., Ltd. operate a brand-new catalysis laboratory, called SynCat@Beijing. Equipped with state-of-the-art surface science and catalysis research tools, this place will provide an excellent breeding ground for scientific talent and synergetic collaboration. We have recruited a number of young research scientists with leadership potential, who are expected to play a leading role in the SynCat@Beijing laboratory. Syngaschem BV also agreed with the Dutch Institute for Fundamental Energy Research (DIFFER) to initiate an industrial public partnership rooted in a shared vision on chemically storing intermittent green energy. In January 2016, Syngasgchem BV has moved its Headquarter into the new DIFFER building on the campus of Eindhoven University of Technology, and started to build up the SynCat@DIFFER lab. 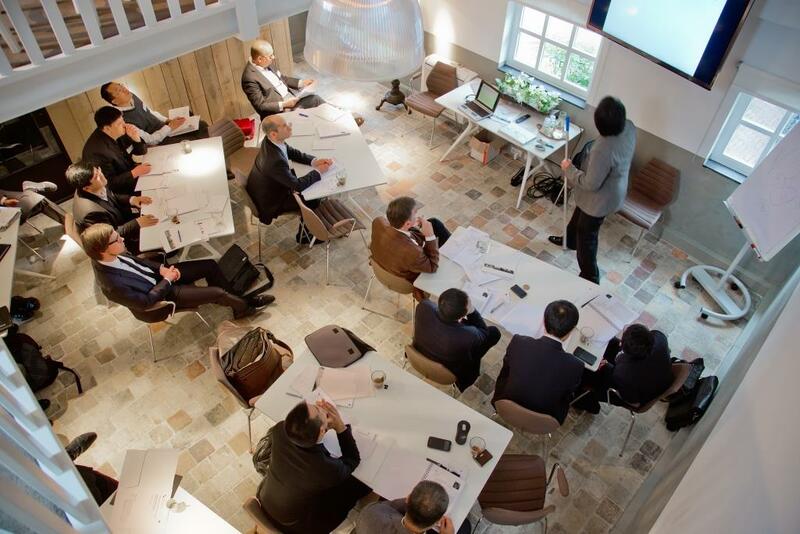 Syngaschem BV invests in its researchers by offering high quality educational programs on fundamental catalysis, surface and material science, as well as a training program aimed at scientific leadership. In the future, the SynCat Ac@demy will host all our educational programs, in combination with a physical center and a virtual e-learning platform. Laboratories and surface science equipment at the new SynCat@Beijing building. The SynCat@Beijing building is located in Beijing's Huairou district, and been completed in early 2015. It hosts state-of-the-art laboratories and equipment. This laboratory is committed to take the lead in fundamental research on Fischer-Tropsch synthesis, sustainable hydrogen production and clean coal-to-liquids technology. Iron-catalyzed Fischer-Tropsch synthesis forms the main focus of its research. Understanding the relations between catalyst composition on the atomic scale, and mechanism of the reaction, as well as activity, selectivity and stability of the catalysts are the primary near term goals of the research program at SynCat@Beijing. In addition, there will be programs on sustainable H2, CO2 chemistry, FTS product work-up and on methods development. The SynCat@Beijing building is presently under construction in Beijing's Huairou district and will be completed in the Fall of 2014. It will host state-of-the-art laboratories and equipment. The SynCat@Beijing building is presently under construction in Beijing's Huairou district and will be completed in the Fall of 2014. It will host state-of-the-art laboratories and equipment. This laboratory is committed to take the lead in fundamental research on Fischer-Tropsch synthesis, sustainable hydrogen production and clean coal-to-liquids technology. Iron-catalyzed Fischer-Tropsch synthesis forms the main focus of its research. Understanding the relations between catalyst composition on the atomic scale, and mechanism of the reaction, as well as activity, selectivity and stability of the catalysts are the primary near term goals of the research program at SynCat@Beijing. Link Fe FTS in action. In addition there will be programs on sustainable H2, CO2 chemistry, FTS product work-up and on methods development. In addition there will be programs on sustainable H2, CO2ÃƒÂ‚ chemistry, FTS product work-up and on methods development. The SynCat@Beijing building is presently under construction in BeijingÃƒÂ¢Ã‚Â€Ã‚Â™s Huairou district and will be completed in the Fall of 2014. It will host state-of-the-art laboratories and equipment. This laboratory is committed to take the lead in fundamental research on Fischer-Tropsch synthesis, sustainable hydrogen production and clean coal-to-liquids technology. In addition there will be programs on sustainable H2, CO2Ã‚ chemistry, FTS product work-up and on methods development. The SynCat@Beijing building is presently under construction in BeijingÃ¢Â€Â™s Huairou district and will be completed in the Fall of 2014. It will host state-of-the-art laboratories and equipment. This laboratory is committed to take the lead in fundamental research on Fischer-Tropsch synthesis, sustainable hydrogen production and clean coal-to-liquids technology. In January 2016, Syngaschem BV has moved its Eindhoven Headquarter to the Dutch Institute for Fundamental Energy Research (DIFFER). Its scientific staff is currently focused on building their new lab, SynCat@DIFFER, and to resume their experimental work on surface science, heterogeneous catalysis, and electrocatalysis. Intense collaboration with SynCat@Beijing is ongoing. SynCat@DIFFER's specific mission is to contribute to fundamental scientific knowledge in the context of green electricity storage with syngas as intermediate. This resonates well with one of DIFFER's major research themes, Solar Fuels, and forms a strong base for the collaboration between DIFFER and Syngaschem BV in the future. From June 2016 on, SynCat@DIFFER's work on electrocatalysis will receive EU-funding, as Syngaschem BV has joined the CritCat consortium (see below). 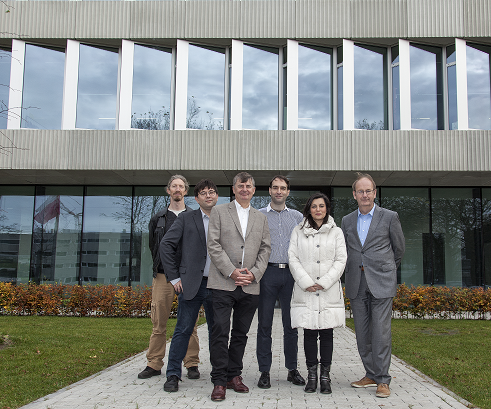 November 2015: The Syngaschem team in front of the brandnew DIFFER building, which is located on the campus of Eindhoven University . April 2015: Profs Richard van de Sanden of DIFFER (left) and Hans Niemantsverdriet of Syngaschem (right) signing a Memorandum of Understanding on future collaboration . Future sustainable energy applications often rely on catalytic and electrocatalytic processes using rare and critical elements. Critcat pursues the rational design of new non-critical catalytic nanoparticles by combining DFT modeling of transition metal particles with machine learning algorithms, using experimental validation of theoretical predictions as a feedback. Syngaschem BV will contribute to the latter by participating in electrochemical characterization and leading the industrial benchmarking of new electrode materials. 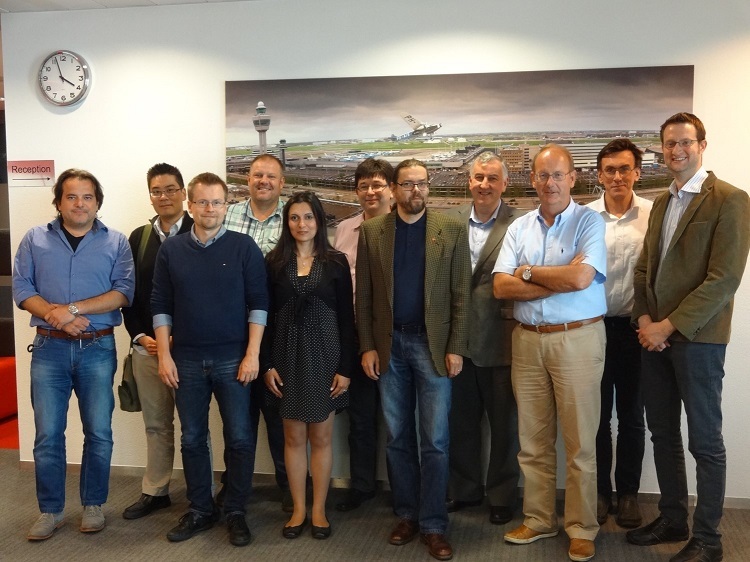 The consortium starts its activities in June 2016. It is lead by Prof. Jaakko Akola (Tampere University of Technology, Finland). CritCat receives funding from the European Union’s Horizon 2020 research and innovation programme under grant agreement No 686053. Naturally, we intend to offer our staff high-quality educational programs on fundamental catalysis, surface and material science. On top of that, Syngaschem BV invests in its researchers by providing a scientific leadership training program designed for ambitious young scientists who want to become leading, accountable professionals in research and education in their future careers. 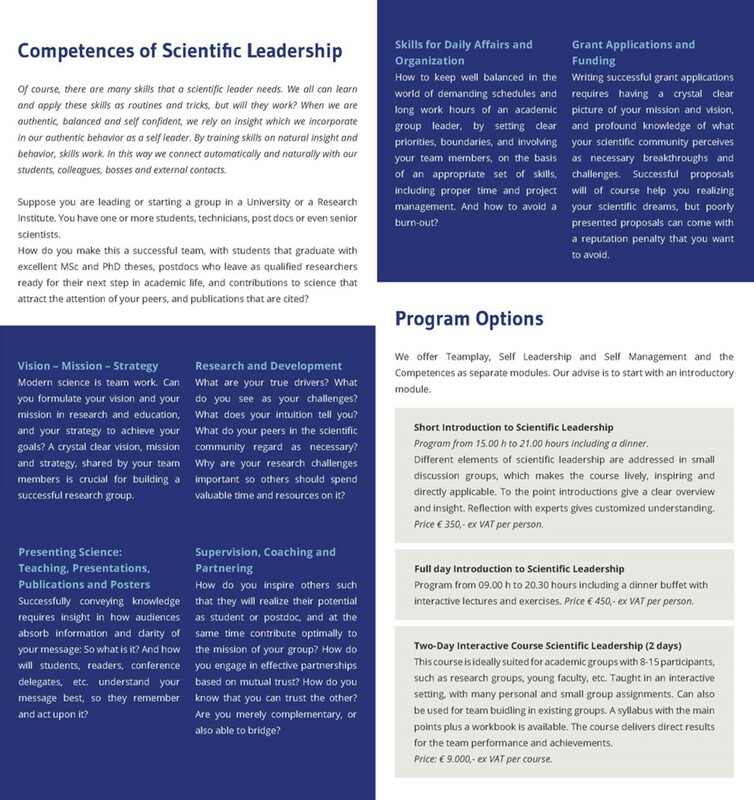 The core of the scientific leadership program is directed at being able to take on accountability based on powerful self-leadership qualities. The inner circle around the core aims at performing responsibly in a balanced way, based on solid self-management qualities. The outer circle is directed at developing and training personal competences and skills, like presenting, publishing, motivating, team building, planning, fund raising, and many other qualities. The SynCat Ac@demy has the purpose to create individual and collective awareness and capabilities, combined with scientific, professional and leadership skills among the staff and partners of Syngaschem BV. We firmly believe, that this is necessary to master the scientific and technological challenges laying ahead. Mastering self-leadership and self-management helps one to utilize competences and skills in a natural way. 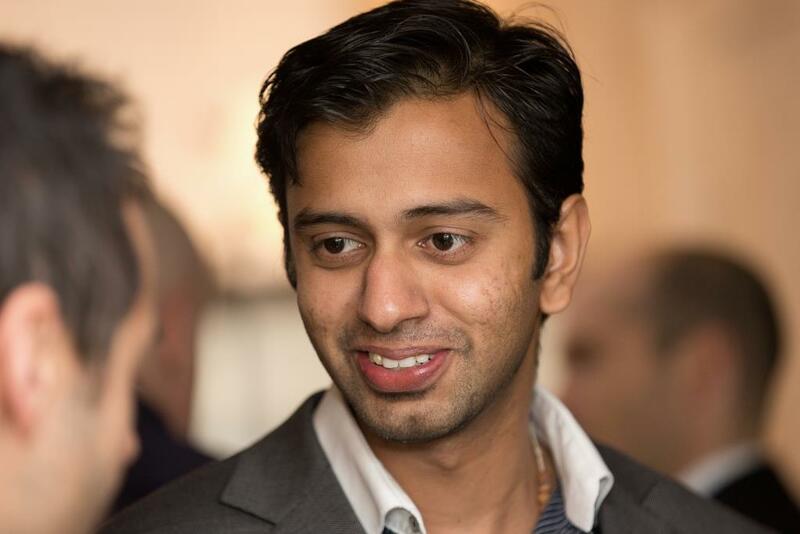 Personal strengths grow, when personal hurdles can be overcome. 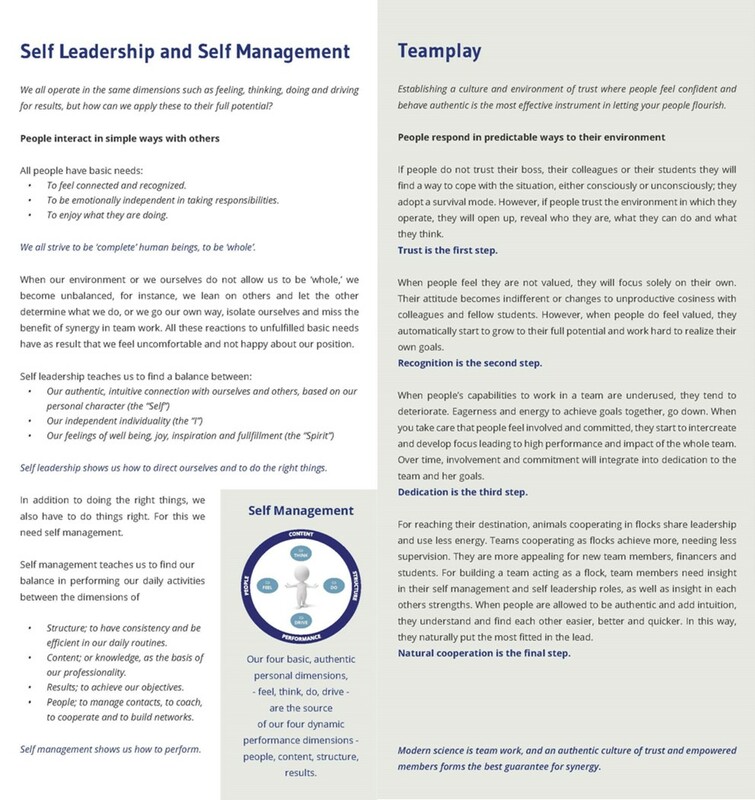 Persons who develop self-leadership and self-management capabilities simultaneously develop skills for becoming a renowned scientist, a successful manager and leader of their future students. Syngaschem's scientific leadership training program is closely tied to Jan-Karel Felderhof, who is an acclaimed expert on self-leadership, and also our Director Strategy, Organization and HR development. 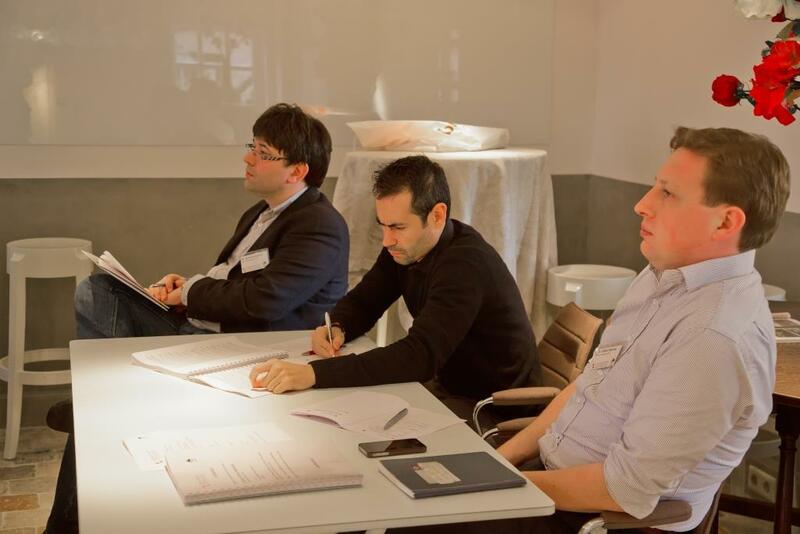 Office Manager Antonio Vaccaro, Dr Jose Gracia and Dr Gilbere Mannie at a workshop.